The GMT COIN series of games have fast become favorites at Metropolitan Wargamers in Brooklyn, NY. The series focuses on 20th-century insurgencies including Andean Abyss in modern Columbia, A Distant Plain in Afghanistan and the Viet Nam War-themed Fire In The Lake to be released in 2014. Future planned games will focus on conflict in Angola and Iraq. This past weekend I got a chance to play the second in the series, Cuba Libre, set in the Cuban Revolution period of 1957-1958. The game plays up to four players, each taking on the role of either Fidel Castro’s 26th of July Movement leftists guerrillas, Cuban President Fulgencio Batista’s Government troops and police, anti-Batista/anti-Communist student Directorio forces or the corrupt Syndicate of casino-owners led by American gangster Meyer Lansky. Using traits unique to each faction, the game plays through a fast-shifting series of diplomatic, economic and militaristic actions toward victory conditions unique to each group. 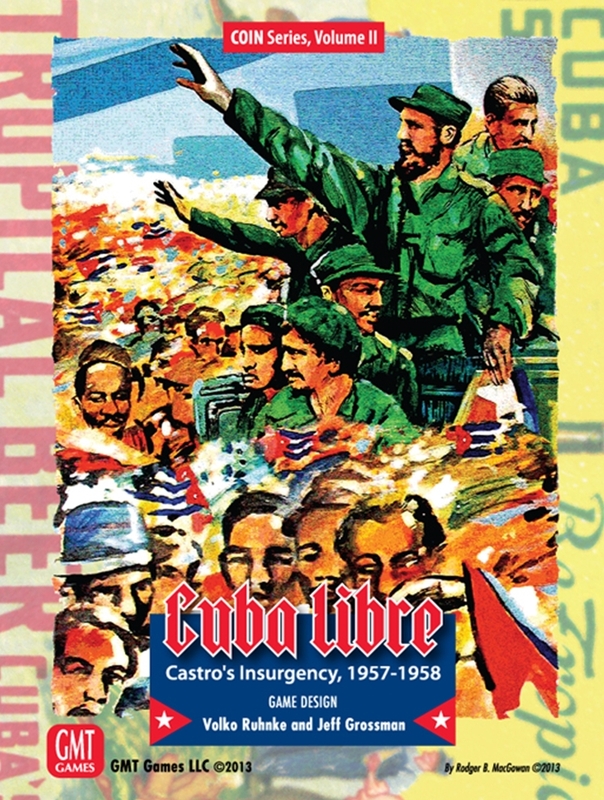 Like other COIN games, Cuba Libre is compromised of a relatively simple map, abstract wooden play pieces, cardboard markers and a stack of 48 event cards. The map features the island of Cuba split into mountain, jungle and grassland areas, cities and three economic centers for the production of sugar cane, tobacco and coal. Each area carries a population point value from a high of 6 in the capital of Havana down to 1 in the smaller cities and rural areas. 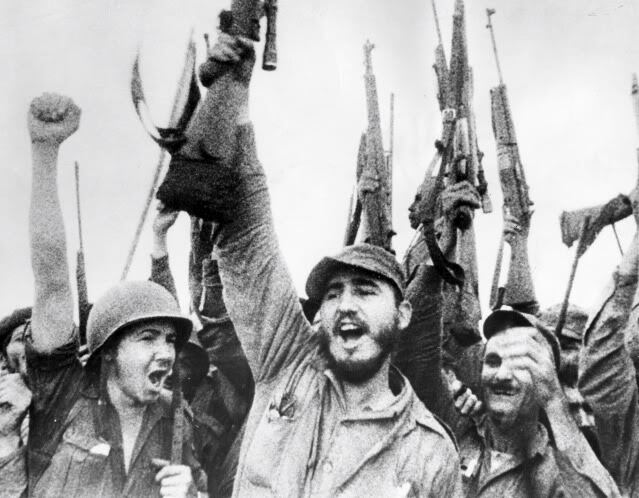 The factions begin with unique set-up conditions with Government troops and police primarily clustered in the cities, July 26th guerrillas in their hidden mountain camps, Directorio forces hiding in Havana and Syndicate casinos in the vacation destinations at the western end of the island. Cities and territories are controlled when one faction’s pieces outnumber the sum of all others in the space. Each space also exists in one of five states of political stability from the pro-government Active Support to Neutral to the rebellious Active Opposition. The game’s shifting control of space and political conditions plays to specific victory conditions. 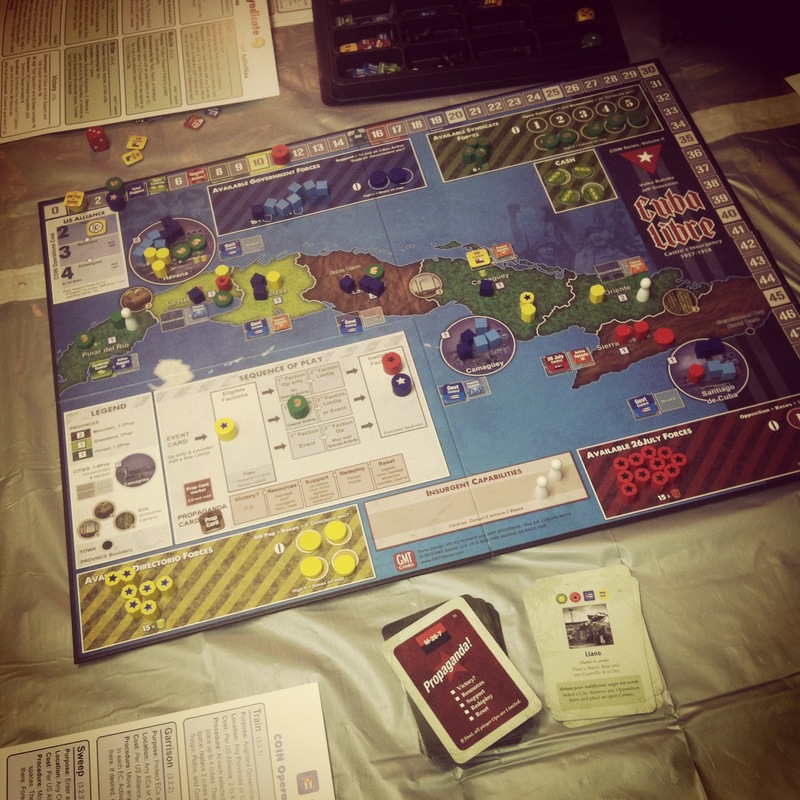 Much of the game’s action is driven by Cuban Revolution-themed event cards which determine the turn order in each round and possible special outcomes. Each card is neatly illustrated with a period photograph, some short historic flavor text and events which may help or harm one or more factions. Players make choices in activating the event card each round or opting for a combination of Operations or Special Activities, again unique to each faction. For example, July 26th rebels can choose from Operations like March, Attack or Terror and Activities like Infiltrate or Kidnap. Government forces may play Operations like Sweep, Train or Garrison and Activities like Air Strike or Reprisal. 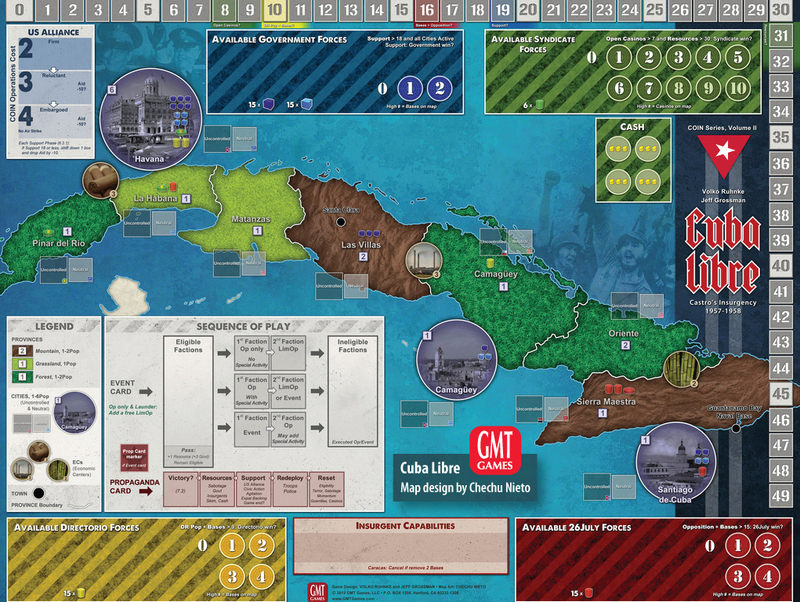 There is a ton going on in Cuba Libre, and the game’s flow can quickly turn. In my first game, the Syndicate player quickly moved toward victory conditions by building multiple casinos. My son, playing as the Government, made side deals on different turns with the Directorio and Syndicate players. My July 26th forces managed to throw much of the board into open rebellion but I could never amass enough of my guerillas where I really needed them. Cutting the game a bit short in the end, we scored it as a Government victory. Learning how to leverage the strengths of a particular faction makes for a lot of replay value in Cuba Libre. The mix of simple components, plenty of space for strategic options and actual history baked in is what makes this and the other COIN Series games from GMT among the best being produced today.